We're all ready to eat more fresh vegetables once spring has sprung, especially after the rib-sticking soups, stews and braises we enjoy all winter. Step away from the bagged version, and stop shelling out for store-bought concoctions with these delicious — and deceptively simple — homemade spring salads. Make sure you only buy as many veggies as you're able to use; most are only at their peak in the fridge for a few days. Let's be honest, is there anything that isn't improved with the addition of mini mozzarella balls? You'll love this unique spring salad, which tosses these tasty little bites together with crisp young asparagus, tender butter lettuce, and crunchy pistachios in a light, zesty lemon vinaigrette. If you've never tried asparagus raw, this is a great chance. Get thin, snappy stalks for the best results. Chopped salads are all the rage, and for good reason. Dicing up the components into similar-sized pieces results in more effective distribution than a traditional tossed salad. This easy, versatile salad uses spring vegetables like radishes, early cucumbers, and any kind of lettuce that shows up at your farmer's market first. Ham and cheese provide a salty element and a hit of protein. Feel free to customize this dish with any vegetables and mix-ins you like best. You've tried seven-layer dip, now lighten it up with seven-layer salad! Crispy bacon and creamy mayonnaise give this salad a rich, satisfying element that keeps the spotlight on the crunchy vegetables. This recipe calls for frozen peas, but if you can find fresh young peas, they're even better. Once you've mastered the recipe, add any vegetables you find in peak season for a new twist. Just because it's a salad, doesn't mean it has to be lettuce-based. Replace the frozen vegetables with fresh ones in this classic potato salad that's packed with veggies and accented with hard-boiled eggs. Make sure you don't overcook the potatoes — leaving them just a little crisp will ensure they hold up under the dressing, even a few hours into a spring picnic. Spinach salad may have had its moment in the 90s, but this delicious, iron-rich leafy green dish never left our rotation. Baby spinach will be everywhere once the weather warms up, so grab a bag and toss this easy salad together. Sweet apples contrast beautifully with crumbled bacon and chopped pecans, and a sweet and tangy apple cider dressing brings it all together. Showcase the fresh flavor and snappy texture of fresh spring peas with this Southern-style green pea salad. A combination of green, red, and yellow bell peppers add color and sweetness, while red onion adds a zing to contrast with the creamy dressing. Make this dish a few hours ahead of time to let the flavors mingle and intensify before serving. You might not think of rice when you think of salad, so let this colorful vegetable dish change your mind. It's packed with spring veggies, like spinach, green onions, carrots, tomatoes, red bell peppers, parsley, and summer squash, all brightened up with a lemon-spiked dressing. If it's too early for some of this produce where you live, feel free to substitute with green peas, asparagus, green beans, or whatever looks fresh at the market. 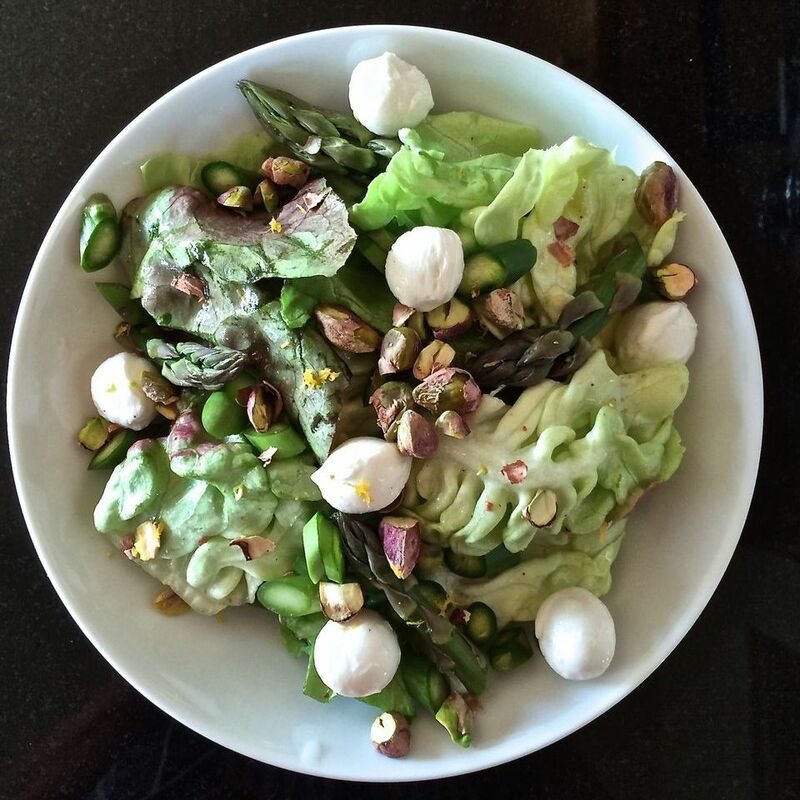 We can't get enough asparagus in the spring, and this delicious asparagus salad is one of the reasons. Shaves or thinly slice these tender seasonal spears, and toss with peppery arugula and protein-packed edamame. Toasty breadcrumbs and sharp parmesan add crunch and texture and make it feel extra-special. A classic herb vinaigrette makes it all sing "spring!" Fattoush is the Middle Eastern answer to panzanella, or bread salad, using pita instead of crusty bread. This extra-crunchy salad is definitely not low-carb, but it is a great way to enjoy fresh spring asparagus and tomatoes in a new presentation. Tangy sumac adds a signature zing that highlights all the fresh elements. Looking to mix it up even more? Add a little tahini for a hearty, nutty flavor. Combine your favorite spring greens, crisp green beans, and freshly grated ginger in this zippy salad that makes an excellent side dish for simple grilled meat or fish. It also makes a fantastic light meal in itself — add toasted pine nuts or almonds for crunch and protein. Grain salads are popular right now for a reason: they're delicious, pack in the protein, and make a nice change from leafy greens while still being healthy, hearty, and tasty. Fresh mint, cilantro, spinach, and spring onions highlight the spring veggies popping up at the market. Chickpeas, tuna, and grape or cherry tomatoes add color and flavor, and you can use multicolored quinoa if you want an even prettier plate. Grilled Pear and Sweet Potato Salad. Regarding BBQ, Inc. If you're firing up the grill, why not toss some salad ingredients on, too? Grilling pears and sweet potatoes imparts a sweet, caramelized flavor, but watch them carefully — they burn quickly! This salad showcases peppery spring arugula and baby spinach, but you can use any greens you prefer. 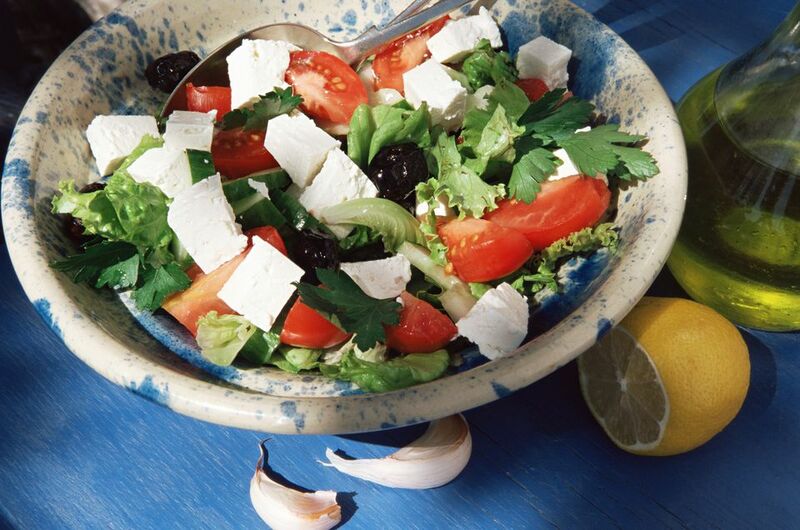 Use real Greek feta cheese for the best results. Spring brings an abundance of fresh spinach, baby kale, and strawberries: everything you need to make this spectacular salad. Chopped chicken, tangy feta cheese, and sweet glazed walnuts give this dish enough variety to make it flavorful enough for a meal in itself. This bright, festive salad's sweet and sour champagne vinaigrette may just make it into your regular rotation! Daikon radishes are peppery and slightly sweet, and they're especially delicious in this traditional vinegar-dressed sunomono. Japanese cucumbers are the classic choice, but if you can't find them, Persian, English, or even regular cucumbers work perfectly fine. Once you've tried the standard version, try mixing it up by adding other spring vegetables into the mix. Rich, creamy goat cheese makes this special occasion salad evoke a trip to an intimate French bistro. It's a mix of spring greens tossed with fresh herbs like dill, basil, or chervil for the freshest possible flavor. Make the goat cheese rounds in the oven or on the stove, and serve the finished dish as a light lunch or starter to a dinner party. You may not think of roasted cauliflower as a salad ingredient, but once you combine it with sweet green peas, spring onions, and quinoa, you'll sing its praises. Cook the peas until just-tender, to maintain their signature toothsome snap. This salad tastes just as great warm or chilled, so it's perfect for a packed lunch. Snappy al dente green beans, sweet and tangy clementines, salty feta, bulgur wheat, and a zippy Dijon dressing will land this tasty salad a prime spot on your spring menus. If you're a meal prep fan, this is a great salad to make for a weekday lunch option — you can make it a couple of days ahead of time. A classic Greek salad always hits the spot, especially when you made it with fresh spring vegetables. Toss peppery radishes, red onion, high-quality feta, cucumber, and tomato with oregano-infused Greek vinaigrette for a taste of the Mediterranean. Kalamata olives are traditional, but use any variety that strikes your fancy. You'll want to make extra dressing to keep in the fridge for future use; it tastes great on roasted veggies and simple green salads, too! Pick up a pack of rice paper wrappers for this hand-held Thai spring salad! This portable dish is packed with fresh radishes, asparagus, snap peas, carrots, and tofu for a light lunch or party-friendly appetizer. Serve the rolls with a spicy peanut or Vietnamese nuoc cham dipping sauce for a flavor-packed bite. You can throw together this simple, delicious cucumber salad in 10 minutes. Fresh cucumber mingle with cilantro in a slightly spicy dressing that will have you coming back again and again. Serve this refreshing dish at the first barbecue of the season, or pack it for lunch alongside a protein—the flavors only get better as they sit.